NASCAR K&N Pro Series East driver Trey Hutchens is carrying more than a special paint scheme on his No. 14 WIX Filters Chevrolet SS in Friday’s Drive Sober 125 at Dover International Speedway. Hutchens is carrying the memory of his late mother, Sharon Hutchens, who lost her battle to breast cancer in December 2009, paying tribute to her and all affected by the disease with a WIX Filters “Filter Out Cancer” breast-cancer awareness paint scheme. Hutchens, 17, takes his black-and-pink No. 14 Trey Hutchens Racing Chevrolet SS to Dover amidst a wave of momentum generated by a career-best finish of seventh in his last NASCAR K&N Pro Series East outing at Richmond International Raceway in September. He would like nothing more than to take his mother’s signature color to Victory Lane at Dover. Hutchens, a high school senior currently competing on a limited basis in the NASCAR K&N Pro Series East, has posted two top-10 finishes in five series starts in 2015. 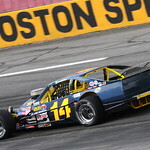 In addition, he simultaneously campaigns in the NASCAR Whelen Southern Modified Tour (NWSMT), where he has scored two top-10 finishes in seven starts this year -- his inaugural year in the series. Hutchens currently holds a sizeable lead in the 2015 NWSMT Rookie-of-the-Year standings. This season marks the sixth consecutive year in which the fourth-generation racer has partnered with WIX Filters in a relationship that commenced with his rookie year in Quarter Midgets. Following Saturday’s series finale at Dover, the up-and-coming driver will compete in the final two NWSMT races in 2015. Friday’s NASCAR K&N Pro Series East race, the 17th of Hutchens’ career, is a companion event to the NASCAR Sprint Cup Series and NASCAR XFINITY Series events also featured at Dover this weekend. The Drive Sober 125 will be broadcast live on Motor Racing Network (MRN) and televised on a delay on NBC Sports Network on Oct. 8 at 4:00 p.m. ET. Off-the-track, the Lexington, N.C., native excels in his high school studies, ranking near the top of his class of 425 students as he prepares to pursue an engineering degree following graduation. For more information on Hutchens, please visit facebook.com/treyhutchensracing or follow him on Twitter at @TreyHutchens. Trey is a sixteen-year old NASCAR driver from Winston-Salem, North Carolina. He currently competes in the NASCAR K&N Pro Series East and NASCAR Whelen Southern Modified Tour. Away from the race track, Trey is a high school Junior at North Davidson High School,where he is ranked in the Top 5 of his graduation class. To learn more about Trey, please follow him on Twitter: @TreyHutchens and like his Facebook page:facebook.com/treyhutchensracing.